Me: Describe the last year in three words. Smarty: Fun,… strict,…a little boring sometimes. Me: How do you want your new year to be? Me: What is your biggest hope for this year? Smarty: That I will learn something that I don’t know yet. Me: What do you want to learn? Me: Do you have any worries about going back to school? Me: What do you think your favorite subject will be? Smarty (looking at me funny): Why, reading, of course! Me: What do you want to do better this year? Smarty: Not to forget my stuff in school. I loved the list of favorite children books from teachers shared last week by Buggy and Buddy. A lot of our favorites appear here and a few books that Smarty hasn’t read yet. I certainly hope that her love of reading continues to burn bright this school year. I also hope that maybe her third grade teacher manages to restore her interest in non-fiction books, because she is “all in” for fantasy books right now. Some of our children are already back to school, and some are enjoying the last weeks of summer. We would love to have you link up your School-Age Post (Ages 5 and up) about your summer learning or the first weeks of school including Crafts, Activities, Playtime and Adventures that you are doing to enrich your children's lives. 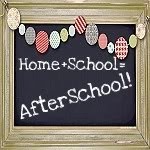 When linking up, please take a moment to comment on at least one post linked up before yours and grab our after school button to include a link on your post or site! By linking up you're giving permission for us to share on our After School Pinterest Board or feature on our After School Party in the upcoming weeks! Don't forget to follow along and join ourAfter School Enrichment Community. Whereas one of my sons would just read nonfiction if I let him. Some of it is an age thing. I hope Smarty has a wonderful year in Mrs. L's class! An interview is SUCH a great idea! I can see it filed in a digital photo album next to their first day picture! I hope your daughter has a wonderful year, and learns cursive and loads of other things she didn't know before! Some great questions! Thank you for sharing at Sharing Saturday! !